PG&E's stock lost more than 20 percent of its value Wednesday after the utility said it does not have nearly enough insurance coverage if it is found liable for a Northern California wildfire that has left at least 56 people dead and destroyed about 9,000 homes. San Francisco based Pacific Gas & Electric Corp. told Wall Street regulators that if its equipment were found to have caused the fire that has ravaged the town of Paradise, California, it "could be subject to significant liability in excess of insurance coverage." That would deal a major blow to the utilities' finances and operations, it said. It noted, however, that investigators have not yet determined the cause of the blaze. PG&E spokesman Matt Nauman underscored that Wednesday, saying that the "cause of the fire has not been determined, so it is uncertain if we could be liable for any of the damages." The utility's stock fell $7.13 to close Wednesday at $25.69, a level it hasn't seen since 2003. It has lost 47 percent of its value since the fire broke out last week. The company said it has wildfire liability insurance coverage of about $1.4 billion for the year that ends July 31, 2019. An analyst with Citi Investment Research estimates damages from the fire could exceed $15 billion but noted that the state of California "will likely step in to protect the utility and its customers." In a lawsuit filed this week, Californians who have lost homes in the state's deadliest and most destructive wildfire said a high voltage transmission line failed, sparking the fire. They accuse PG&E of failing to maintain infrastructure and properly inspecting and maintaining its power transmission lines. "We are aware of lawsuits regarding the Camp Fire," Nauman said. "Right now, our primary focus is on the communities, supporting first responders and getting our crews positioned and ready to respond when we get access, so that we can safely restore gas and electricity to our customers." PG&E told state regulators last week that it experienced a problem on a transmission line just before the blaze erupted in the vicinity. In a filing with the state Public Utilities Commission, it said it had detected an outage on an electrical transmission line. It said a subsequent aerial inspection detected damage to a transmission tower on the line. 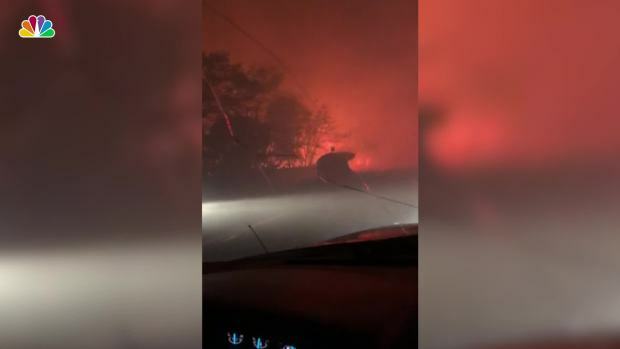 Joe Allen and his 3-year-old daughter Olivia were escaping the Camp Fire in Paradise, Calif., when they hit some traffic and were surrounded by flames. The father made sure his daughter felt safe in the car.